Did you know you can handle all of your incoming paper in less than an hour a week?! You heard us – less than an hour a week! We know paper comes at you from all directions and that you think it’s impossible to ever manage it all. Behold… iRAFT©! We have created a system that simplifies all your interactions with the paper & information. Remember a SYSTEM – Saves You Stress, Time, Energy & Money! Let us introduce you to iRAFT. *Please note that we recommend implementing this system and starting in present time. Once you are familiar with it and have every step in place, then go to the piles, filing drawers, etc. to clear out and clean up. Paper is its own beast and is very overwhelming. If you desire the help of an organizer, please contact us. As we mentioned above, the information is coming from many places; the mail box is only one. Think about how much easier it is to start into your email because it is in your INBOX. So for the paper, choose a container that will hold a week’s worth of incoming paper and put everything there! This includes mail, flyers, notes, etc… You also need a place for thoughts, conversations and such to land. You might use an app on your smart phone, Evernote or a small spiral notebook. We often ask our clients to describe how they feel about FILING. We hear words like yuck, overwhelming, impossible, always behind, drawers are full. And there is a constant theme of not know what to keep or for how long. So start with setting up a “to file” container and then schedule time once a week or once a month to file, depending on your volume. If you really hate filing then get someone else to do it. 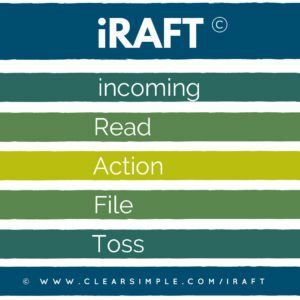 By sorting once a week into RAFT, your tossing of the paper is now easy. Have fun noticing how much of that paper pain is really toss papers. Of course you can still throw away junk mail and such before it even lands in your space. Daily – plop all the incoming paper and information into the container. Weekly – take 5 minutes to sort into 4 piles – Read, Action, File, Toss. Then take each pile to it’s proper container.